Mary « Hercules and the umpire. Mary came to work for me soon after I became a Magistrate Judge in 1987. An undergraduate degree from New York in German, a Master’s degree from Notre Dame in linguistics, and a career running Creighton University’s “English as a Second Language” program for medical students and others, set her far apart from the other applicants. The fact that she was also a senior editor of the Creighton Law Review was important too. I hired Mary, and, of course, after several years the Chief Judge came calling. Mary “went up stairs” for several years as a career clerk to the Chief. Then, stretching herself, she became a line federal public defender and appellate specialist. After that, back to yet another Chief Judge as a career law clerk. She is semi-retired now. Our jury panel proceeded for voir dire to Nebraska State District Court Judge Russell Bowie’s courtroom. This was delightful as I was acquainted with Judge Bowie from his lawyering days. I was questioned thoroughly. As a lawyer I probably made the cut because since 1994 little of my work had involved civil law. The jury included many women and few minorities. My favorite juror friend for the week had a distinctive white stripe in her dark hair. When not in court we were either in the jury room or allowed to roam. I was struck by the frugality of the jury facilities compared to the plush surroundings in federal court. Our sole amenity was a water cooler. It was fascinating to watch the attorneys as a juror. I found the plaintiffs’ attorney to be a nice guy but stiff, nervous, and bland. The defense attorney is a lawyer by day and actor by night. His delivery was mesmerizing. Only one witness still stands out in my mind—the plaintiffs’ so-called expert witness, an Ob/Gyn physician from Glenwood, Iowa, 25 miles from Omaha. The man was creepy. He testified that he had lost privileges at the Glenwood, Iowa hospital for some unstated reason, and if a Glenwood patient had to deliver a baby he would meet them at the Creighton University hospital, the only hospital where he enjoyed privileges. On Thursday afternoon the parties rested and closing arguments were held. We began deliberating. We voted for a jury foreperson, and two others were enthusiastic about assuming the role. I was not, as I wanted to blend in with the group. We began by taking a vote. We were 50/50 when it was time to go for the evening. On Friday morning one juror said he had been physically ill the night before thinking about the responsibility we held. We discussed the sadness of the case and the doctor’s reputation being at stake. Our early Friday vote showed no change. So we talked about the evidence and the witnesses. We discussed the creepy doctor. At one point some jurors wanted to tell the Judge we were deadlocked, but we decided that in doing so we would not be doing our job. Periodically we took votes, and gradually the scale began to tip in the doctor’s favor. A turning point came when we saw in a medical record that the wife had previously been pregnant. This was significant because we thought that indicated that her septate uterus and its complications were no surprise. This earlier pregnancy was never referred to in court. We wondered why and felt that this important matter had been deliberately hidden from us. Did the husband not know of the prior pregnancy? Was there a protective order that prohibited it from being raised? At any rate, once we found this one tidbit buried in a stack of medical records the vote soon became unanimous in favor of the doctor. So often a verdict seems to come at the end of the day, end of the week, or right before lunch. In our case the Judge’s bailiff had stuck her head in late on Friday morning and asked if we anticipated reaching a verdict before or after lunch, because if we knew it would be after the noon hour we would be provided a pizza lunch. We weren’t sure at that point when we would be done, so in came the pizza. They must have experience with this as a method to encourage consensus, as over our pizza we made our final decision—unanimous in favor of the doctor. We jurors talked about how surprisingly exhausting it was to do our job. It was hard to sit all day, all week, and go home tired just from paying attention and endless sitting. Many used the lunch hour to walk or go to lunch. I walked a block to my office and worked. I felt like every other part of my life had to be on hold. After the trial I received phone calls from both lawyers asking about their performance. I gushed to the defense attorney about his stellar performance, skillful questioning, and other attributes. He very sincerely thanked me on behalf of his client. I saw him about a year later, and he did the same when I told him I had been on that jury. My conversation with the plaintiffs’ attorney was difficult though pleasant. He started by telling me to be completely honest. So I was. I told him his expert was creepy and inexperienced in septate uteruses, and that one should not put on a creepy Ob/Gyn in front of a largely female jury. When I was done he asked me, “So, was there anything about my performance that you liked?” I came up with something. He then confessed that he had never had a medical malpractice case and that he was a bankruptcy lawyer who had taken the case as a favor to a friend who was related to the plaintiffs. I never saw my fellow jurors again, and I would not recognize any of them on the street except for the woman with the white stripe in her hair only if she still has the stripe. Our lives were intertwined for one intense week, we did our job, and then life outside the jury room went on separately for all of us. We all took it seriously, and there were no whiners or complainers. We were all undoubtedly richer for the experience that we all appreciated. Thank you, Mary, for your insights. I miss you! 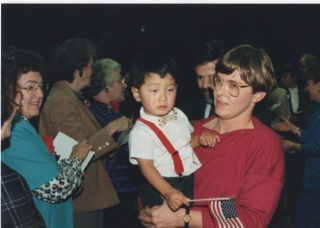 A long time ago I had the privilege of presiding over the naturalization ceremony where Mary’s little boy in red suspenders, a bow tie and waving an American flag became a citizen. He is all grown up now. The river of life . . .